Pipette.com has added the Eppendorf Centrifuge 5424/5424 R Promotional Offer to their comprehensive portfolio of Eppendorf products. The Centrifuge 5424/5424 R (refrigeration) is ideal for Molecular Biology and general laboratory applications. The Eppendorf Centrifuge 5424/5424 R replaces Centrifuge model 5415 D and 5415 R. It is innovative because of its speed, durability, and temperature range. Furthermore, Centrifuge 5424/5424 R is a highly advanced 24-place model that is very compact, quiet, and equipped with a multitude of features, including able to be equipped with 4 different rotors, -9°C to 40°C temperature range (Centrifuge 5424 R unit), and maximum RCF of 20.238 x g for Centrifuge 5424 & 21.130 x g for Centrifuge 5424 R.
Founded in 1996, Pipette.com operates the largest independent calibration facility on the West Coast and is a major distributor of pipettes, tips, tubes, plates, and lab equipment. They are known as the one-stop shop for the life science community offering exclusive offers, promotions, and a broad selection of products. Pipette.com is the official distributor of Eppendorf®, Sartorius®, Drummond®, Capp®, Wheaton®, and BrandTech® among other major brands. 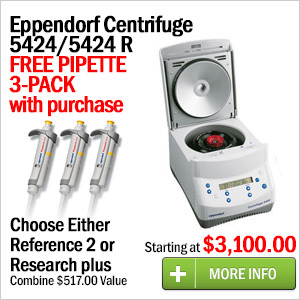 Take advantage of the Eppendorf Centrifuge 5424/5424 R Promotional Offer and other Eppendorf promotions by visiting http://www.pipette.com/EppendorfCentrifuges?sbr=5196&sbn=Eppendorf%20Centrifuge%205424/5424%20R%20Promotional%20Offers.